Sexually mature at: 8 – 12 weeks. Gestation period: 21 – 24 days. Litter size (average): 6 – 11. Weaning period: 3 – 4 weeks. Can live up to 18 months in the wild, but 3 – 4 years domestically. Rats are very adaptable and can be found in a variety of habitats, usually in close conjunction with humans. Burrowing, but sometimes climbing they are the only species to occur in UK sewers. Norway rats are omnivorous eating fish, vegetables, weeds, earthworms, nuts and fruit, but prefer protein-rich foods, such as cereals. during the day if colonies become too over populated. They live in loose colonies, made up of aggregations of clans – usually defending their territory from other rats – the biggest rats are dominant over their smaller counterparts. Brown rats swim well and are sometimes mistaken for water voles. They have well-developed senses of hearing and smell. As with mice, look out for holes, droppings, smear marks and unpleasant smells as these are signs a building may be being used as a run. They are subject to persistent pest control due to the damage they cause and the numerous diseases they spread. Combined head and body length: 70 – 90mm. Length of hind feet: 16 – 19mm- Brown-Grey fur, with slightly lighter under-parts. House mice have large ears, a pointed nose and the tail is usually around 80% length of the head and body. Litter size (average): 5 – 6.- Weaning period: 3 weeks. Mice are usually ground living, found in areas near to human habitation nesting around the undisturbed parts of buildings climbing through wall cavities and voids using them as tunnels. They are also found in open fields burrowing, building complex tunnel systems with several exits. Mice are omnivorous but prefer to eat cereals and insects. They will eat around 3g of food and drink up to 3ml a day if their diet is particularly dry, although the can survive without any additional water. Mice are typically nocturnal, although they will sometimes forage for food during the day if colonies become too over populated. Look out for holes, droppings, smear marks and unpleasant smells as these are signs a building may be being used as a run. 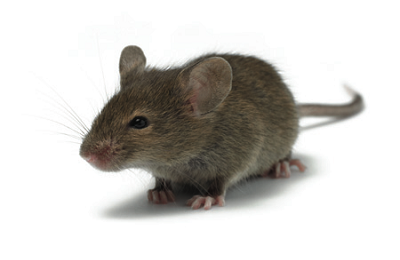 Mice are subject to persistent pest control due to the damage they cause and the numerous diseases they spread. Along with rats, they are considered to be the most widespread terrestrial mammal.